Robotics and automation have, for some time, been providing huge productivity savings across a number of market sectors. As these markets evolve, so does the technology that is available. Gone are the days of industrial robots simply moving something from A to B. Today both client and consumer demand dictate that automated supply chains must have a level of flexibility and diversity that can adapt to changing trends, quickly and efficiently. To support such changes, the characteristics of a robot can be altered, through the introduction of end of arm tooling, or end effectors, which allow it to interact with its environment. The exact nature of this device depends upon the application in which the robot performs, though there are a huge variety of end of arm tools available, from grippers (electronic, pneumatic and magnetic) to a diverse variety of tools designed to serve various purposes where uniformity is essential. When we consider the nature of the end of arm tool required, we should look at the products that a particular line handles. Lean manufacturing practices today mean an ever-increasing diversity of packaging variants exist. Shorter cycle times, aligned with demand, dictate that we must be reactive and have to hand the tools that enable us to address changes quickly and efficiently. Picking, packing, stacking/de-stacking and palletising/de-palletising are all processes within the supply chain that require the adoption of automated processes, primarily due to their non-ergonomic characteristics when undertaken by humans (bending, lifting, twisting, reaching) but also as a means to ensure that a competitive advantage can be maintained; supply versus demand. As diverse the applications that do exist, end of arm tool manufacturers are diversifying the portfolio of products available. Though in some circumstances an off the shelf solution simply doesn’t meet with requirements. Space constraints, configuration and environmental need are all key considerations that should be addressed. Finger grippers, clamp grippers, vacuum grippers (pneumatic), fork grippers, magnetic grippers, layer grippers, bucket grippers, servo grippers, the list is endless (according to the needs of the application) though at this point due consideration should also be given to the robotic element within the application in question. Reach and payload of the robot will dictate size and weight of the gripper that is to be utilised, in addition to the product(s)/load that is to be lifted/moved. So how do you go about identifying where automation could provide operational efficiencies within your supply chain? We have already touched upon non-ergonomic processes and removing potentially high risk activities from humans, but let’s also look at areas where we could add value. Consider a process that involves the movement or placement of multiple items; cans or canisters as an example. Large volumes would be difficult to manage by manual means, the process itself would be tedious and throughput would be slow. Cycle times could also potentially be affected by toppling and dropping (where damage could also occur). An industrial robot equipped with a modular vacuum grip could execute the movement of large volumes of an item in one cycle. We have already touched upon the need for diversity and flexibility within the supply chain to ensure that we can react to changing trends and demands, but imagine a line in which you are able to manage several products simultaneously. A vacuum gripper designed and optimized to be used in various applications, for the handling and manipulation of several products with different shapes, dimensions and compactness. With the correct reach and payload of industrial robot, together with a suitable vacuum gripper and you have an application that is able to satisfy your pick and place requirements with ease. Manufacturers such as Piab can design a vacuum gripper that meets with your exacting requirements and are continually developing new products and concepts as the demand for reliable, flexible, automated gripper technology increases. 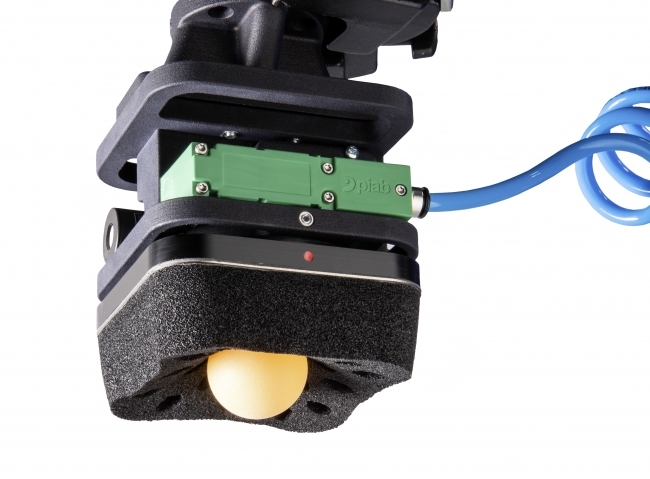 One such gripper is the KCS series that has been specifically designed for integration with collaborative robots, also referred to as cobots. 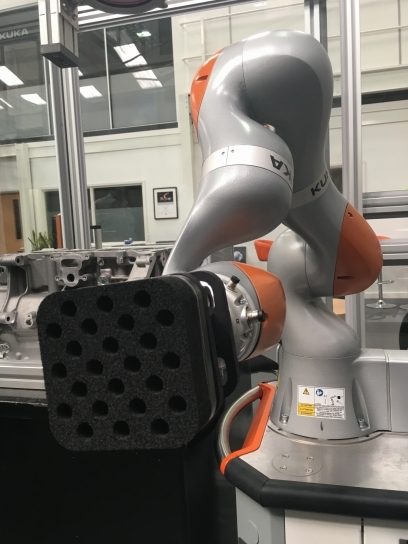 KUKA will be at the forthcoming PPMA show with a live pick and place demonstration featuring the LBR iiwa (industrial intelligent work assistant) the world’s first series-produced sensitive robot, incorporating the KCS vacuum gripper. The LBR iiwa series features two variants, one with a 7kg payload, the second with a 14kg payload. The media flange options include electric or pneumatic, the latter perfectly suited to supporting a vacuum grip without the need for an external energy supply.